The center was established to provide comprehensive medical & physiotherapy services to the Dubai community. It was established by the late Dr. Abdulhussain Kamkar in 1939. 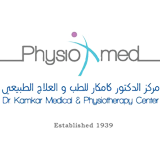 At Dr. Kamkar Medical & Physiotherapy Center you can rest assured that you have chosen the right place for your family's medical needs. We put medical ethics and a commitment to high quality as our priority. We understand that medicine is about people, so you can rely on us for your medical needs and just concentrate on getting well.